Scion HID Lighting Kit. Aftermarket HID Kit for Scion FRS, tC, iQ, xA, xB & xD. 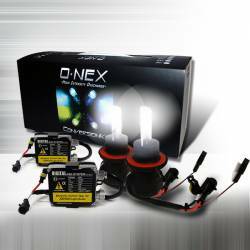 Onex Scion HID Lighting Kits are available in numerous Bulb Sizes and HID Colors. The perfect lighting upgrade for Optimum Night Vision and show quality look. 04-06 Scion xA HID Kit. HID Lighting Kit for Scion xA. Onex HID Kits are available in numerous color temps and bulb sizes. Whether you have OEM or Aftermarket Headlights, we have the right HID Kit for your xA complete w/ 1-year warranty. 04-06 Scion xB HID Kit. HID Lighting Kit for Scion xB. Onex HID Kits are available in numerous color temps and bulb sizes. Whether you have OEM or Aftermarket Headlights, we have the right HID Kit for your xB complete w/ 1-year warranty. 08+ Scion xB HID Kit. HID Lighting Kit for Scion xB2. Onex HID Kits are available in numerous color temps and bulb sizes. Whether you have OEM or Aftermarket Headlights, we have the right HID Kit for your xB complete w/ 1-year warranty.